Still in love with this yellow car image. I rec'd a call early Thursday from a friend looking for a piece to give as a gift. No, I said, I don't have anything on hand except for a 5ft. piece that I have sort of said that hubby could have. They figured that the larger piece was a bit big and expensive for this event and asked if I could work on something half the size. 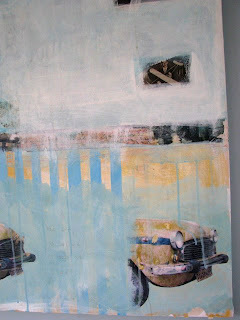 So, me being that type the never says NO, did it - and got this 2' x 3' piece done in a day! Pretty impressed with myself I must say. I think that I will be using this yellow car a lot in my future!! 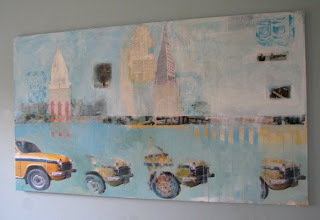 I have been working quite a bit on a nearly finished 5 ft. canvas that I have made for the kitchen wall. Hubby wanted something "very collage like" with bright colors. Well, he didn't get the palette he wanted but he did get a piece of his own photography - a picture of a car he took while in India. When I saw this photo, I knew that I had to use it somehow. I used a lot of tranfers in this piece and although I have yet to perfect the technique, I like where it is going and have a bit of inspiration for some newer, larger pieces. 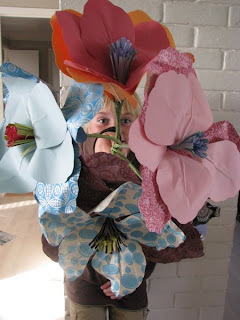 I have also been having a bit of fun working with some paper projects including paper flowers. I love these! I like the size and the fact that they keep their color and don't ever die. Wonderful as we start heading in to the dark months here in Norway. And finally, the wonderful Angela Cartwright has awarded me with this fantastic Brillante award, something which I am not quite sure that I deserve, but nonetheless, will take it, thank her and pass it on. There are so many blogs out there that I visit frequently so I will list a few more for your viewing pleasure. Check out the ones in my previous post as well! I had so much fun in my first little collage class, that I decided to do more! 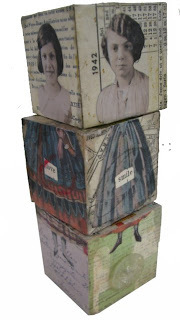 Yep, there will be lots of fun stuff to share from now until Christmas including my favorite, collaging on wood. 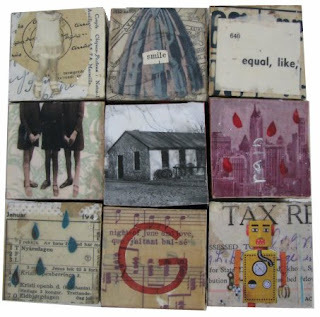 I love these little blocks that can be individually collaged and then coated with soft beeswax. I am hoping that they will really be a hit! If you want more info. go visit the folks at Scrapshop.no for course information. After years of contemplating, I finally did it. I decided to dive right into the world of teaching. It all happened on Monday as I was taking a walk/jog around the lake. The time was 9 am and I was thinking to myself how I didn't want to go home and do the same old thing I do everyday; clean house, grocery shop, paint, sit on the computer, etc. I needed a change. 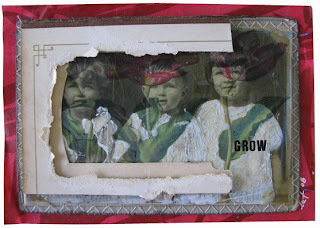 So, much to my own dismay, I shut off my inner critic, packed a bag with my new portfolio, some small collaged works, a 3D shadowboxed collage and my house from "In This House" and trucked off to the scrapbook shop. Much to my disappointment, the owner was not there and would not be returning for a couple of days. Of course, I was somewhat relieved thinking that I could now go home and avoid any uncomfortable feelings of selling myself. However, instead of driving home, I drove to the neighboring town to a shop I had never been into before. I went in with my bag, my heart in my throat and my palms sweating. --Sheesh, that sounds so lame, but I was so nervous that I could barely speak (oh, don't forget that I have to speak Norwegian as well during my sales pitch)! -- Anyhoo, the shop was empty for all but the two owners. I sat down, took out my samples and they were sold! I couldn't believe it! Currently, collage is something somewhat new and exciting here and I am thinking that it is my chance to get the interest going! People seem quite keen to do other things other than just scrapping. To make an even longer story short, I am giving my first basic collage course on Saturday at a scrapbooking fair and then have two more classes scheduled in some weeks. As you can imagine, I am nervous but also terribly excited! 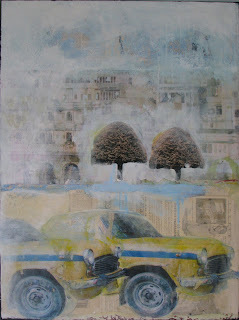 I really hope I can get these scandihoovians hooked on mixed media art! Now, back to creating some class samples and to taking a deep breath!